What to do with the interior stairs of your home? In “HOME SAFETY – how to “Ramp” it up”, I discussed how ramps ease moving up and down stairs. This works well for outside steps. But what about your interior stairs? Even if you have no steps to contend with, chances are, you know someone who does. Split-level and multi-story homes are very common. Ramps still work when floors are separated by a few steps…but not for full story stairways. The best answer for multi-story homes is to live on the ground floor. If your ground floor includes a place to bathe, sleep and prepare food, you’re in good shape. If not, you may need to repurpose some rooms, such as converting a den or home office to a bedroom. Hopefully there’s already a bathroom but this too may need some remodeling. If that bathroom has a tub, it’s best to replace it with a stall (if possible, curbless) shower. If it’s a half bath with just a sink and toilet, maybe a closet can be replaced with a small shower. If there’s still too little room, try a sink where you can sponge bathe. It’s not ideal, but it beats dealing with stairs. Kitchens are usually on the ground floor. If yours isn’t, set up a space where food can be prepared and stored. 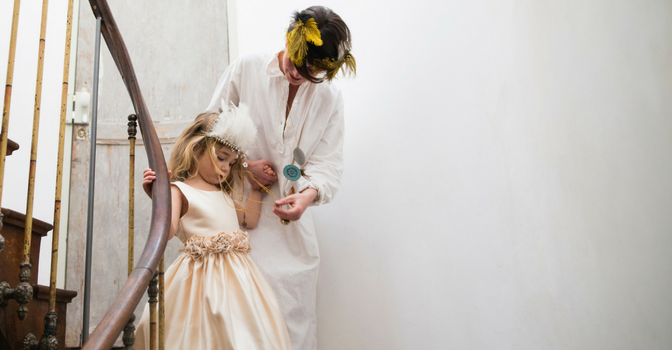 With these basic needs met on one floor, you minimize the challenge of negotiating steps. One reason why stairs are problematic is due to outdated building codes. Too many in the industry ignore the millions who need assistance to get around. Current building codes allow stairways to be as narrow as 36 inches with only one handrail. When we have full mobility, that’s plenty. But with aging, this gets to be a problem. What if you’re using a cane? A walker? And of course, a wheelchair is out of the question. 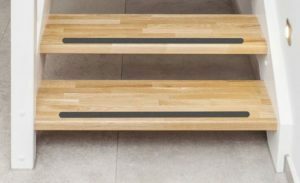 When it comes to stairs, homes thoughtfully built for safety have 42 to 48-inch widths and two handrails…both of which extend beyond the top and bottom stairs. For more assistance, add a stair lift or elevator. Ideally, the stairway has at least one 90 degree angle so if an elevator is needed, it can snuggle right in with the stairway. *Extra safety tip: If you’re building a new home or remodeling now, think about stacking one closet over another. This creates a ‘shaft’ that’s ideal for an elevator in the future. Still out of your range? 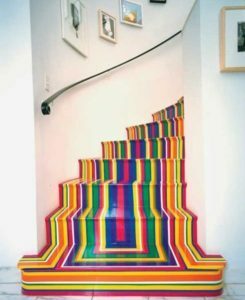 At least make your stairs as safe as possible by color contrasting the steps edges. As you can see below, contrasting colors aid the eye to distinguish the different step levels. These steps are easy to see and navigate. You can also make each step skid-proof by adding adhesive backed traction strips. Make sure the edges are firmly pressed down so nothing sticks up. If your stairs are carpeted, think about removing the carpet and finishing off the steps with color contrasting traction strips. This skid-proof tape also adds color contrast! Whatever you do, avoid the staircase design shown here. 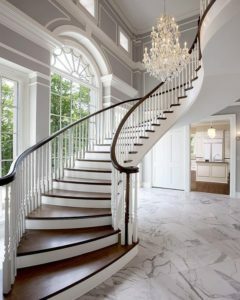 Still not sure what to do with your interior stairs? Get a consultation to help you decide what to do to make your steps safer. 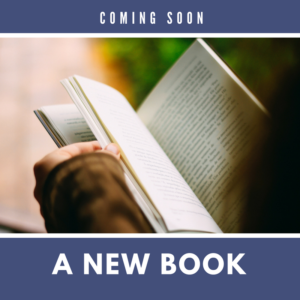 We’re excited to announce a new book in the works! It’s about how safe homes not only keep you safe and happy, but extend your retirement dollars so you don’t outlive your money.